Searching for information about getting an angioplasty in Singapore? I've seen many worried patients and family members pass through my clinic doors as an interventional cardiologist over the past 20 years. This is understandable - heart disease is amongst the top 3 killers in Singapore. What does it mean when your heart vessels are blocked? Your heart pumps blood around your body through blood vessels. Heart disease often begins when heart vessels become blocked by a build-up of fatty deposits called plaque. This makes it harder for vessels to supply blood to the heart. How does your cardiologist determine whether you require an angioplasty? An ECG records your heart’s electrical activity in order to identify an abnormal heartbeat or damage to the heart muscle. A stress test evaluates your heart rate and rhythm while you are exercising. An echocardiogram measures the chambers and heart function using sound waves. It's also able to check your valves and major blood vessels. A coronary angiogram is a test used to find out where the blocked heart vessels are, and how much narrowing there is. "Okay, I'm confused. What's the difference between an angiogram, and an angioplasty?" This is a common question that often confuses my patients, because they sound similar! An angiogram is merely a diagnostic tool used to reveal blockages in heart vessels. On the other hand, an angioplasty is a treatment that involves inserting heart stents to improve blood flow to heart muscle. Widening a narrowed heart vessel results in fewer angina symptoms and a better quality of life. A coronary angiogram and angioplasty may be done soon after a heart attack, or if you have angina. It's possible that you will go on to have an angioplasty WHILE having an angiogram as part of the same procedure. Indeed, treating heart disease usually begins with lifestyle changes and/or medications that help improve blood flow to your heart muscle. However, your angiogram will clearly show the blockage in your coronary arteries. I always make sure to explain ALL available treatment options to my patients. I emphasized the last point, because at the end of the day, our job as doctors is simply to give you the best advice on all your available treatment options. Yes, an angioplasty may NOT be the best choice of treatment for you! This is why I always tell my patients that it's important they take the time to understand all their treatment options. How much does an angioplasty in Singapore cost in public vs private? The total cost for an angioplasty in Singapore depends on whether you go to a private or public institution. What are the most important factors that affect the cost of an angioplasty in Singapore, and can you claim Medisave? 4. The type of heart stents used. The most commonly used heart stents in Singapore are drug-eluding stents. Less commonly, bare metal stents are used. Drug-eluding stents can cause about $2000 alone, while bare metal stents cost about $400. Bioresorbable vascular scaffolds (BVSs) cost even more. At your consultation, the cardiologist will be able to recommend which type of stent is most suitable for you, and how many stents you required. It's important that you ask for full price transparency of the procedure. Many hospitals do not include prices for essential provisions such as anaesthesia and theater costs in the initial price quote for you. If you want to get more personalised quotes for an angioplasty tailored to your condition, it helps if you reached out to a few doctors directly. Finally, yes, you are also able to claim government grants and subsidies, as well as claim from your Medisave for the angioplasty if you are Singaporean or a PR. Why do most patients prefer having a heart stent inserted over a bypass operation? Heart bypass surgery uses a healthy blood vessel taken from your chest, leg, or arm to redirect the flow of blood around a block heart vessel. Most of my patients prefer to have an angioplasty because unlike a bypass operation, angioplasties do not require any surgical incisions or general anaesthesia. More importantly, 90% of angioplasties are successful. This means that 9 out of 10 people will be able to get complete relief from angina. My patients also like that they are able to recover much more quickly from an angioplasty, as compared to heart surgery. Your coronary artery has a small chance of narrowing in the same place and causing angina symptoms again. This recurrence generally happens in the first 6 months. This is why I tell all my patients that it's very important to take their medication and maintain a heart healthy lifestyle even after the angioplasty. What are the different types of heart stents available? A heart stent is a metal tube that's inserted into your narrowed heart artery during an angioplasty. 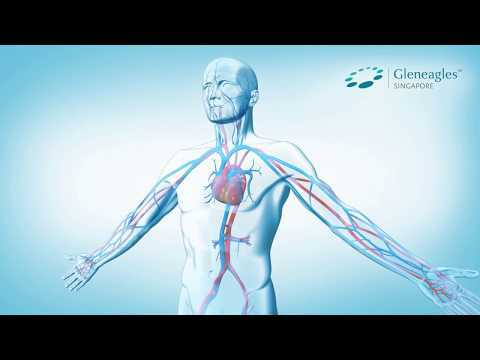 It acts as an internal support framework to keep the artery open by pressing plaque back against the artery wall. Bare Metal Stent (seldomly used nowadays) – a metallic mesh tube. Drug-eluting Stent – a metallic stent that's been coated with medication to prevent re-narrowing of the heart vessel. Bioresorbable Vascular Scaffold (BVS) – a non-metallic mesh tube that slowly dissolves once the blocked artery can function naturally again and stay open on its own. Which is the best heart stent for you? There's no one "best heart stent”. However, there may be a better suited heart stent for you, according to your condition. This is why I alway make sure to explain the characteristic of the heart stent that you will be receiving. For example, there are certain types of special heart stents that are best-suited for diabetics. Other types of heart stents may require lesser doses of blood thinning medication, and hence are more suitable for elderly patients. What should you expect during an angioplasty in Singapore? If the imaging from your angiogram show a blockage that can be treated immediately, your cardiologist may decide to perform an angioplasty as a carry-on from the same procedure. A coronary angiogram usually takes about 30 minutes. You'll be lying under an X-ray camera in a cath lab while your cardiologist monitors the procedure on a television screen. You'll then receive a local anaesthetic injection into either your arm or groin (depending on where the catheter will be inserted). When this area is numb, a narrow tube (sheath) is inserted into the artery. A thin, flexible plastic tube called a catheter will be threaded through the sheath. The catheter is guided through the artery until it reaches the point of blockage. The sheath in your arm or groin will be taken out at the end of the procedure. Pressure will then be applied to the insertion site for up to 20 minutes to stop any bleeding. How painful is an angioplasty? This is a common question from my patients, but you need not worry about pain at all! You'll be awake, and I'll be in conversation with you throughout the entire procedure, so I'll know if you are in pain or not. My aim is to ensure that you are as comfortable as possible, at all times. Most of my patient's discomfort comes from when the local anaesthetic is injected at the start. The rest of the angioplasty does NOT cause any pain, although you may feel transient angina-like pain for about 30 seconds when the balloon is inflated. What are the risks of an angioplasty? What will happen after your angioplasty in Singapore? After your angioplasty, you'll either go home that evening, or stay in hospital overnight. Most of my patients are able to resume normal everyday activities within 1 -2 days. You should be able to return to work after 1 week. How can you get the best results after your angioplasty in Singapore? I warn all my patients that an angioplasty is NOT a cure for heart disease. It can certainly help to control your symptoms, but it does NOT fix the underlying heart disease that caused the symptoms in the first place. To reduce the risk of further heart issues, you'll need to make important changes to your lifestyle. All my patients get a customised care plan and cardiac rehabilitation programme after their angioplasty. Create a plan to stop smoking. Try to lose weight, even if it’s only a few kilos. Even a 3 to 5 kg weight loss can significantly reduce your risk of heart disease. Make exercise a part of your daily routine. Regular physical activity releases hormones such as endorphins and vasodilators that help you maintain healthy blood vessels. Monitor your blood pressure, cholesterol, and blood sugar. Also be sure to limit your sodium intake and eat healthy foods. Take all medications prescribed by your doctor. Finally, you should aim to return to work and all your other activities sooner - this lowers your chances of having further chest pain and anxiety. How can you find the best cardiologist in Singapore for a successful angioplasty outcome? Time/convenience versus cost (public vs private route) - you can read more in this post about choosing a cardiologist in Singapore. Finally, you may also send an enquiry to a few cardiologists to clear any concerns that you have before visiting the clinic. I know this guide has been rather lengthy, but I thought I'd close by sharing with you what I tell all my patients - don't try to become a new person overnight in your pursuit towards leading a healthier lifestyle. Instead, set achievable goals and make changes gradually. If you want to lose weight, work steadily towards a realistic goal. If you want to reduce sugar in your diet, eliminate sugary drinks a few days a week. Small changes over time greatly increase the chance of making a permanent change. Finally, do enlist the support of your friends and family members. You’ll be much more likely to stick with an activity when they've got your back! Dr Julian Tan is a physician and cardiologist at Mount Elizabeth Hospital. He is proficient in all aspects of interventional cardiology. Dr Julian is also a Clinical Senior Lecturer at the Yong Loo Lin School of Medicine, NUS and a Core Clinical Faculty Member of the NHG Cardiology Senior Residency Program and a Clinical Teacher at the Lee Long Chian School of Medicine (LKCMedicine). When Does Diabetes Affect Your Kidneys And How Do You Manage It?